If you haven’t realised it by now, I’m the kind of person that keeps a lot of plates spinning in my professional life. I end up getting excited about things and find it hard to say no, even when I don’t have the capacity to give things the time they deserve. Perhaps because of this overload, and my avoidance of putting a financial value on my work, I have always struggling to get on top of the finances of the business, keep up with invoicing, respond to queries and book things in with enough time to complete everything before the deadline. However, I have relentless standards for my own work, so I try to do everything to the best of my ability, even if it eats into my time out of work (or even my sleep). Having so much on the go requires a lot of organisational skills, and I know that I sometimes fall short in this regard, so I am very reliant on having a good team around me and particularly a good PA. Thus it was a disaster for me (although fab news for her) when my admin decided to leave Lifepsychol earlier this year and go and bake cakes instead. Worse still, it came at a time that I had two new Assistant Psychologists without prior experience starting in post, and a whole lot of deadlines. I had also concluded that delegating the book keeping to the accountants was not cost effective, as they did not understand the ins and outs of the business, or have access to our files or close enough communication with me to resolve queries. I was starting to panic that I wouldn’t be able to keep up with the demands and everything would fall apart. Thus it is great news that I have recruited a new admin/operational manager, who is helping me to get everything organised, and has taken on the finances of the company, along with some of the personnel functions. This has been a lifeline as it has really taken the pressure off me, and allowed me to start chipping away at a to-do-list that has been growing much faster than I have been able to check items off it. It is helpful that there is a central point of contact for the company who is there on a full-time basis, and that is making all our lines of communication easier, especially as I seem to be all over the country at the moment! Today we signed up for Google Apps for Work to set up shared cloud storage for the company, and a more professional company email, calendar and task-list system. We are gradually working through the state of the finances, and catching up with invoicing. We even sorted out the materials in the cupboards, and re-homed the five boxes of left over questionnaires from the diabetes study, some materials that were ordered in error, and a massive collection of used lever-arch files. This really pleases my inner OCD, as I really dislike the feeling of disorganisation and clutter in my physical or psychological space. I have high hopes that once we are organised things can tick over in a much more satisfying way. I’ve also been offered one of 10 UK places to be supported by ImpactHub to scale up one aspect of my business over the next year, so I’ll write more about that in my next blog! When I left the NHS I wondered whether I would have enough work to keep me busy, and felt like the expert witness work I do the family court would probably be the main strand of my income for the foreseeable future. However, perhaps because of my book, I have increasingly been asked to speak at conferences, provide training to various groups of professionals, and consult to organisations – particularly on the topic of working with attachment, trauma and the impact of maltreatment on children. This has become an enjoyable sideline where I can cascade psychological thinking to a wider audience, meet lots of new people, learn from others, and earn a good daily rate without the same emotional weight as doing court work. I also like any work that involves improving the quality of services, particularly for complex or marginalised client groups. It was therefore very interesting to me when I was asked to meet up with some of the directors of a children’s home company, Keys Childcare, about offering training and consultation to a 20 placement project they were running about an hour away from my base. After some initial meetings, we decided that I would offer some staff training sessions (on attachment, trauma and the impact of maltreatment on children’s development) to all the staff, and then help them to implement a more systematic program of care planning and outcome measurement. The aim was to make decisions about which young people needed therapy and what form of therapy they received more evidence-based, as well as to ensure that all of the staff were involved in making the care for each young person as therapeutic as possible. This fitted in really well with an outcome measurement system I had been developing for several years, using my ‘BERRI’ checklist of Behaviour, Emotional well-being, Relationships, Risk and Indicators of something requiring further assessment (such as markers of neuro-developmental conditions, or more usual behaviours, perception or thinking which would merit more specialised interventions). I had already developed a system whereby data could be entered into the BERRI online and produce a feedback report, and scores could be compared to track progress over time. This could produce a visual representation of a young person’s needs across the five dimensions, and allow us to be more holistic in our thinking about how to support them to make optimum progress. After discussion with friends and colleagues, I had started to develop a system for targeting particular concerns to address in the care plan. This involves identifying around three specific concerns from the BERRI and tracking them with greater frequency, typically daily, whilst giving the staff various strategies to try to address them. The target behaviours can be entered into the online system, which can then produce graphs to show progress and to identify any triggers. 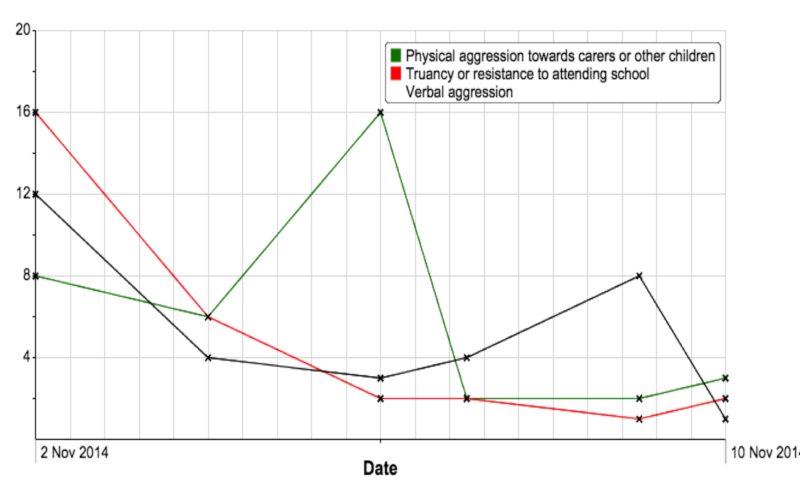 For example, in the chart below I’d hope that staff would instantly wonder what triggered the big green spike of aggressive behaviour. I spent a couple of days each month with Keys, completing the staff training and improving the online system so that it would meet their needs. We also developed a pathway in which there would be a psychological screening assessment when young people arrive in placement, and their paperwork would be properly digested to ensure we had all relevant information from their history as well as an initial BERRI checklist, and we would bring this together in a meeting where the professionals around the child, their care team, the therapist linked to the home and myself would put together a therapeutic care plan document and identify the targets to work on over the coming months. The care plan could contain a summary of the history, a formulation section giving insight into the meaning of the behaviours and concerns the child was showing, then the targets we had agreed to track, and the strategies we had identified to help work on those concerns. This was seen as a refinement to the existing therapeutic plan the homes in the project were already using, and embraced very positively. We called the approach Psychologically Informed Care-planning and Intervention, with the acronym PICI (which Jonathan Stanley, Chair of ICHA, said was an acronym that led naturally to a marketing slogan: “if you want the best for your child, get PICI”). After a few months of seeing the changes within the local project, and gathering feedback from staff, social workers and commissioners, Keys decided to expand my remit. They asked me to do training for staff outside of my local project, and then to do some consulting to the wider organisation. They subsequently offered me a job as Clinical Director of Keys, with a remit to train all of their staff and implement the pathway across the whole organisation. This will take me three days per week for the next two years! They have also agreed to employ a psychology team to implement the project in each region, and this week we appointed the first qualified clinical psychologists. In time this team will grow to cover all of Keys services across the UK. We will also be taking on 3.5 assistant psychologists and more therapist time, so that we have a consistent level of consultation to each home in the company (with additional therapy time in the attachment homes where every child placed gets direct therapeutic input). This is super exciting, and I hope that we are able to evaluate the impact on both staff and the young people we look after. Keys have embraced the new pathway and outcome measurement system as part of a wider push to improve staff training (which now also includes a modular training program that every staff member will work through) and to be able to evidence the effectiveness of their care. This includes a desire to be more evidence-based in how they make decisions about placements and interventions. The changes also coincided with the tenth anniversary of the company moving into childcare and buying the initial ten Keys homes from their previous owners, and also with a rebranding exercise. When they revealed the new branding a few weeks ago in Belfast I was delighted to see that Keys now describe themselves as providing “psychologically informed care for children and young people” and see this as a way to improve the quality of their placements (and through this to gain better Ofsted inspection grades, and become the placement of choice when commissioners seek to place complex young people). It seems like a natural progression from the kind of consultation I was doing in a CAMHS LAC team, but on an organisation wide scale. My small amount of time has the power to influence more children by working indirectly. By “giving psychology away” I hope I am giving increased insight to those doing the day to day care, and slightly changing their way of working with the young people. Instead of a child getting one hour per week with me, they are getting 38 hours per week with a slightly more psychologically minded caregiver, and my influence can reach 320+ children and nearly 1000 staff. The staff within Keys have been really enthusiastic about the new pathway and have given me positive feedback for the training days, so the although there is a lot of travelling and a very ambitious timetable for implementation I am really enjoying the work so far. I also get surprisingly positive feedback from training elsewhere, which is so lovely to receive. I think it really stands out for me given how few positive feedback loops there are in most clinical roles nowadays (beyond the occasional client or colleague sending a thank you card). I get a real buzz from positive tweets about my training or keynotes, gaining high scores on conference feedback forms, positive reviews of my book, or complimentary endorsements on LinkedIn. I went up to Glasgow last week to train some staff to run my group program for parents and carers of maltreated children (Managing Behaviour with Attachment in Mind) and really enjoyed that also. Glaswegians really are the friendliest people in the world, and the group I trained were clearly hugely empathic to the children they work with so they were a delight to train. As I was leaving someone said to me that “training is a way to change the lives of thousands of children”. I think I had made some comment to brush this off (perhaps that it was the clinicians working directly with the families whose relationships were vital, rather than a day from a person like me), but she wasn’t having any of it. She said “no I mean it. I will interact different with the families I see tomorrow and in the future because I spent the day with you, and each person who came to the training will do likewise”. She explained emphatically that she had literally meant that in one day I had done something that would ripple out and change huge numbers of lives. That was pretty humbling to think about. I’ve also had some exciting discussions about research, service evaluation and different kinds of therapeutic work (for example, working in partnership with collaborative lawyers). So I have decided to have a break from doing expert witness work over the summer and really have a think about what I most want to do. I need to weigh up all the choices in front of me, prioritise the things that make the most impact and/or give me the most satisfaction, and put some energy into finding allies with shared goals (including seeing whether I can recruit another clinical psychologist to LifePsychol in Milton Keynes to pick up some of the therapy and court work). I also want to reclaim my life outside of working hours, and to consider where in the country it makes most sense to be located. But it feels like all the effort I have invested in various projects to date is finally nearing fruition, and there are lots of interesting things on the horizon. Long ago, I had a task list written on the whiteboard in my office, and Gilly had made me laugh by adding to the bottom of this “build secret volcano base, take over the world”, to reflect my ambitions to change practise on a wide scale. Maybe it isn’t such an unrealistic aim after all.